Whether you live in a tropical climate, or just want to add a touch of summer to your decor all year round, this Ombre Pineapple Glass Coaster allows you to personalize even the smallest of details that help make your house a home. Dishwasher Safe; however, for maximum life, we recommend hand washing. Special DyeTrans® material ensures your design will transfer beautifully to this coaster. 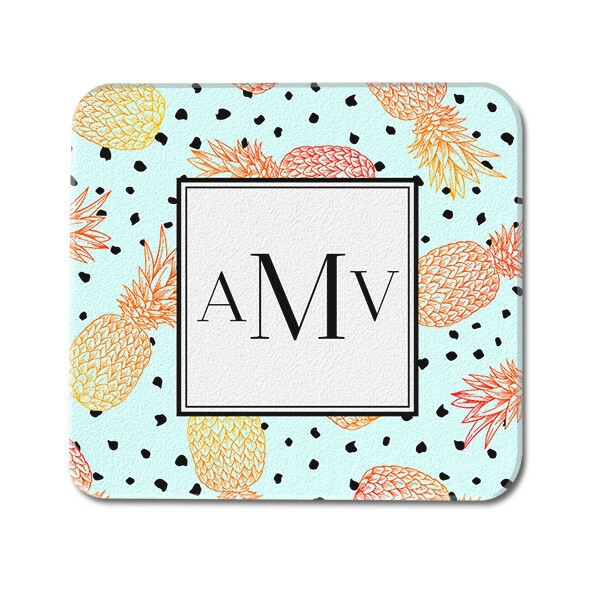 Tropical getaways feel a little bit closer with this Ombre Pineapple Custom Monogram Glass Coaster. The epitome of function and style, this Chinchilla-finish tempered glass coaster, which features your monogram with a vibrant, tropical print, is constructed to last for many years of enjoyment. Personalize yours for the home, the office, or entertaining; it's the perfect finishing touch to any occasion, whether it's a celebration or just another Tuesday.